Photolithography patterning is provided on almost all coating products of TFD. Metals such as Al, Al:Cu, Cr, NiCr, Ni, Au, Pd, Pt, Ag, Cu, Mo, Mo:Cr and many other alloys and oxides like I.T.O., IMITO™, & Black Cr. (Cr203). These are patterned as small as 2 micron resolution with sharp and tapered edges on up to 370 mm x 470 mm glass and other wafer substrates, 150, 200, & 300 mm. Quality is ensured for all patterns. No residual coating remains in etched areas as small as 2 microns. The Plastic substrates are also patterned but to a lesser Resolution, 10µm features. 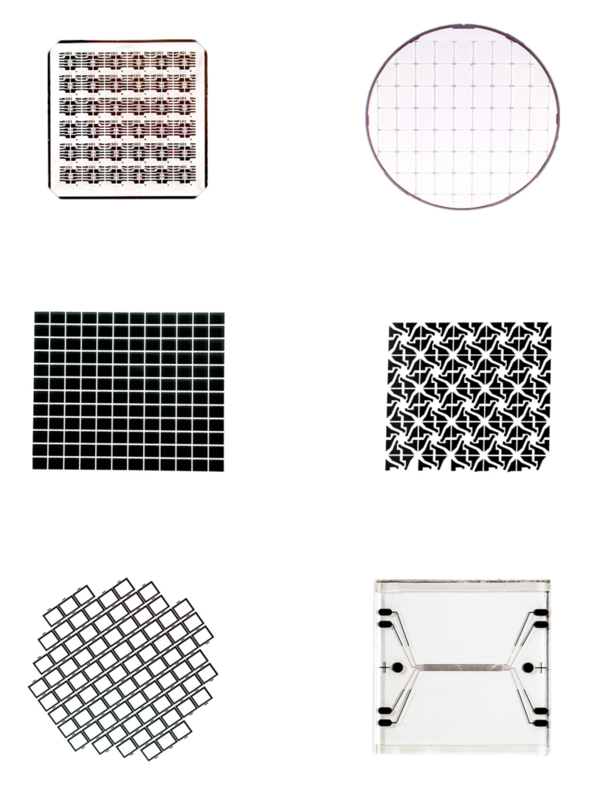 Numerous display panels and IC masks are products requiring this high-quality patterning. a. Capacitive Touch Displays I.T.O./I.M.I.T.O.™/Dielectric & Metal. g. Black Mask Black Cr/Black Resist. h. Other Products for Research & Development.